PSE, or Planed Square Edge timber is used in internal joinery applications where a precise finish is required. It is a kiln dried wood which guards against twisting and splitting. There are often 2 sets of profile measurements next to the title of a PSE product. The first is the original size of the timber, the second, the measure in brackets, is the planed finished size of the timber, i.e. the actual dimensions of the finished product you would receive. This is because PSE timber loses some of its width and height during the planing process. 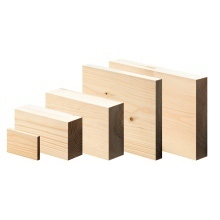 Typically there are 3 grades of wood, unsorted being the highest grade, followed by sawfalling grade, which contains a mixture of the best and medium grades, and 4th grade or 5th grade, which are used where the appearance of the wood itself is less important.